Fans of band’s brutal discharge had to wait six years for a new album under the sign of Azarath, who had given themselves an exceptionally long publishing break. Almost 2 decades old band keeps the ball rolling, and fortunately does not give in into artistic pursuits, resulting in – supposedly in the name of musical maturity - softening of their message. From the heaps of black/death metal slag that their previous (excellent by the way) Blasphemers' Maledictions buried us with, surprising melodious bits were often sticking out like dandelions, and the band did not shy away from the previously unprecedented accessibility of the sounds they played. It perfectly refreshed Azarath’s music and added more space to their art, which translated into the best album of their career so far. Six years is long enough for the hungry musicians to awaken the layers of aggression and lividness again, and with In Extremis they returned to the more brutal ways that they have accustomed their followers to. Already the ear thumping, piercing sound of the guitars opening the "Triumph of Ascending Majesty" and the whole album makes the whole brain explode like a watermelon hit with a shotgun. That’s what this is all about. Soon, within the next few minutes of the album playing, the suspicion turns to certainty - this time there will be (almost) no mercy. There’s definitely less melodious solos here, and the brutal and tireless storm of tones, fueled by perpetual percussion gallops of Inferno and tweaked with the usual venomous and proximal to black metal singing manner of Necrosodom, definitely stands out on the forefront. Only a longer time spent with In Extremis allows you to discover that after all there are many flavors here, and the musical level at which Azarath resides nowadays simply does not allow for a simple, primitive bashing. The most obvious example is "The Slain God". I realize that it would be completely barren to seek a common ground between Azarath and Behemoth, but it is in this song they’ve come to the fore - in the climate of composition, in the melody of guitars, in characteristic for Behemoth's passages of Inferno, or finally in the only recited fragment of text . One cannot miss the interesting ending of "The Triumph of Ascending Majesty" and a few other moments and, frankly, it is a pity that the band does not decide to take a little more often to these less obvious solutions - I must admit that I was very pleased with the image presented on Blasphemers' Maledictions. Azarath definitely does not disappoint with this material, but it also does not surprise the listener. Formation in accordance with the best black / death metal art canons continues the ruthless crusade, which in a nutshell consists of grabbing the listener and pummeling him with sound. The band's fans will certainly be pleased, both those who have been waiting for the quartet's full return to the realm of brutality, and those who have admittedly accepted a slightly larger dose of melody - they will find it on In Extremis. There are new challenges facing the band and one of them is the unexpected departure of Necrosodom. Let's hope we won’t have to wait as long for the next album. Alas, the moment is upon us. Finally, after six years we can delight ourselves in the sixth, long-awaited album of four Poles with pitch black souls. Material for the album was recorded in 2016 in several different studios, and mix and mastering was done in Satanic Audio by Haldor Grunberg. This full length consists of 10 pieces of devilishly good death / black metal lasting less than 41 minutes. The author of the demonic cover art is Marta Promińska (Hypnagogic Painting) and high rating for the entire publishing package goes to Agonia Rec. And that would be enough of dry data, now it's time for the music! If anyone experienced Azarath’s sonic beating even once, then one knows this music without compromise - either you like it or don’t even approach. This is also the case this time. 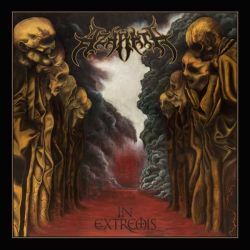 But what distinguishes In Extremis from other publications is the so-called ‘it’, also known as the element of "hit material" as others call it, which does not fit for either death or black metal, and even more so for Azarath, but this magic "something" or “it” makes you inhale this album straight up . I was hooked on Lost Soul’s "Atlantis ..." same way recently and although both bands are moving in the same musical direction, they sound a bit different. I fully agree with the publisher's description for Azarath as the "demonic mutation of Krisiun and Behemoth with shades of Immolation". This is a very accurate observation. There is no time for intros, prologues or other inductions on In Extremis – just pure energy. They make your ears ring from the first to the last second. Some moments of respite appear in the ending of 'The Triumph Of Ascending Majesty' and 'The Slain God'. Blasphemy pours out with every note and every word screamed by Necrosodom. Those snarls of his in 'Sign Of Apophis' and in the beginning of 'Into The Nameless Night' sound like demonic rants during exorcism. No priest should come near this position even with the bible and the sprinkler in his hand. Real carnage!! There is noticeable progress in construction of solos. It may not be a quantum leap compared to the Blasphemers Malediction, but it’s still a move forward. The sound is much clearer – bravo Haldor! It seems to me that both sides have benefitted on this mastering collaboration. Maybe the band lost some of its underground soul, but you gotta give something to get something. Now it is easier to enjoy the melody of these musical explosions and the sounds of drums, guitars and vocals, and as you know you can write a lot about every instrumentalist of Azarath. It is difficult to acknowledge any of the songs over other ones on this album. It is simply bitchin' in its entirety. Perhaps the reviewer should not be so easily fascinated with the subject, but I am first and foremost a fan of heavy sounds, and what Azarath offered on In Extremis directly crushed me. The summary will be short - the sixth material of this quartet is a must for every black and death metal fan, under any latitude. I suppose, however, that the current Minister of National Education, in spite of the many advantages of In Extremis, will not list it on the list of mandatory listening material. Still, I recommend the In Extremis to be tested individually and cannot wait for the local stage version.